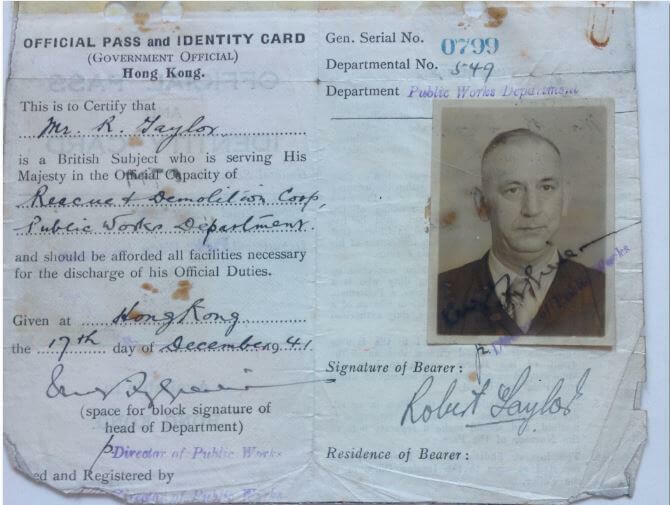 Robert Taylor was manager of the Green Island Cement Company from about the late 1920s until the Japanese occupation of Hong Kong and again for a short period after its liberation. He was born on 2nd June 1888 and died in January 1974 in his 86th year. 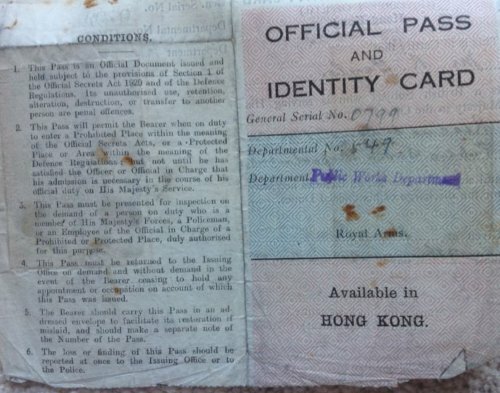 Immediately prior to the Japanese occupation of Hong Kong he was a volunteer in the Rescue and Demolition Corps as show in this Pass and ID card dated 17th Decempber 1941. I asked Tony Banham who runs the Hong Kong War Diary website, linked below, about this presumably special WW2 Public Works section. Tony kindly sent this link Rescue and Demolition Corps. Jane Taylor: “When the Japanese invaded Grandpa pushed his much-loved Humber Snipe into Hong Kong Harbour as per official instructions to the civilian population at the time. Grandpa was interned in Stanley Camp throughout the war. Whe the Americans bombed Stanley in January 1945, Robert was blown through the window of the bungalow he was living in by the force of the blast. Thankfully, he survived though he received severe injuries to his back. Owing to these injuries I understand that grandpa was among the first from Stanley to be repatriated to the UK by bomber soon after Hong Kong’s liberation; a long and uncomfortable journey by what I’ve been able to glean, but much quicker than going by ship. 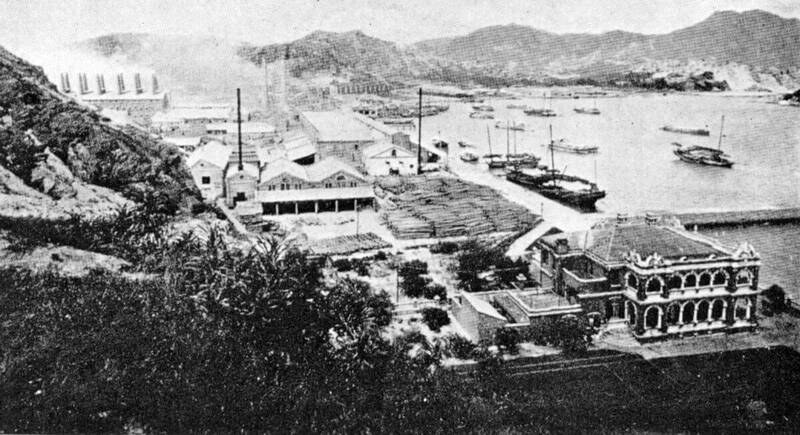 Following a period of recovery at home In Glasgow, he and my grandmother (who had come back to Glasgow in 1938 to be with my father and my three aunts), he returned to Hong Kong until his retirement in 1949. ” (extracted from source 1). Jane adds, Tony was wondering where the rest of the Taylor family was, when HK fell? That’s an easy one to answer: ‘Back in Glasgow!’ For reasons I don’t fully understand given what a close-knit family they were, my grandparents brought my two eldest aunts, born 1921 and 1923, back to Scotland in 1933. Then aged 12 and 10, the aunts were enrolled in the Glasgow Girls’ High School, and spent the next 5 years being shuttled between relatives in term-time and holidays. By 1938, my father and my youngest aunt were aged 13 and 12 respectively, and Grandpa was due his next overseas leave. At that point, the HK Taylors returned to the UK. My grandparents bought a house in Glasgow, and Grandpa went back to Hung Hom by himself. I assume that the plan was for Grandma to stay in Glasgow until the youngest aunt finished school – I really don’t know the details; and, of course, the war intervened. 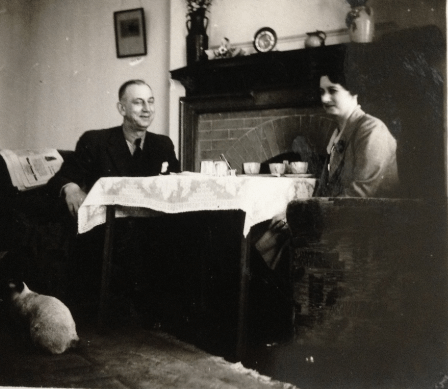 This photo is of Grandpa at a tea table with an unknown lady and siamese cat – evidently taken by my grandmother. I haven’t a clue where it was taken as the room has a different ‘feel’ from the others in the Green Island Manager’s house but don’t know where else it might be… definitely Hong Kong, though. Hong Kong War Diary – Tony Banham’s website which documents the 1941 defence of Hong Kong, the defenders, their families, and the fates of all until liberation.